Weight: 0.14 ct; size: 2.97 | 2.96 | 2.08 mm; shape: round; colour: black; clarity: opaque; cut: good; treatment: none. Small opaque specimen; good brilliant style cut. Source: David Weinberg, Multicolour Gems Ltd.
An intermediate variety of the hercynite-spinel series, iron-rich spinel or magnesium-rich hercynite. 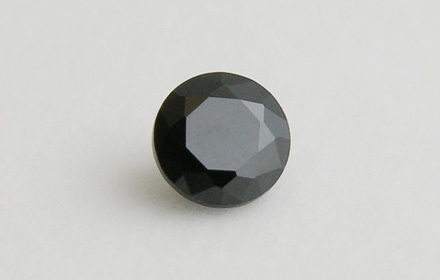 Often called black spinel.